ZARA Phillips visited the Royal Windsor Horse Show to announce a new engineering scholarship programme. TWO members of Solihull Hospital’s communities team have been honoured at a national awards ceremony in London last week. Solihull court usher takes on eight fitness challenges in aid of Macmillan. A COURT usher has been inspired by his magistrate colleague to take on EIGHT gruelling fitness challenges - including an open water swim - in aid of Macmillan. 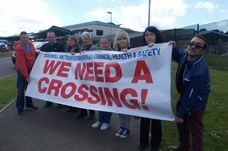 Solihull campaigners gather following concern for future of NHS. CONCERNED residents are adamant they do not want to see the health service handed over to the private sector after a meeting held to discuss radical changes to the way the NHS is run. AN 84-year-old from Shirley was forced to spend the festive season recovering in hospital after becoming the victim of a Christmas Eve hit-and-run. George William ‘Bill’ Gameson had been on the pedestrian crossing in Stratford Road, Solihull, at around 9am, when he was run down by a car. A NEW life-saving skin cancer drug, first used by a former teacher from Shirley, has been approved by a health watchdog. A SOLIHULL man whose ear was bitten off in a vicious attack three years ago, appears on a new TV programme about pioneering prosthetics. THE Solihull Thursday Club (a division of Solihull Hebrew Congregation) has won The Queen’s Award for Voluntary Service, the MBE for groups of volunteers. SOLIHULL is swimming red, white and blue, with Diamond Jubilee celebrations set to draw to a close today (Tuesday). AN INNOCENT Solihull pensioner had his jaw broken in a brutal, unprovoked attack after a vicious thug asked him for a cigarette. A SWAROVSKI crystal embellished portrait of a young Queen Elizabeth is going on show at Solihull’s Castle Galleries. THIS is National Newspaper Week, celebrating the contribution that local newspapers make to their communities. Solihull diamond wedding couple recive telegram from the Queen. THE Queen took time out of her busy Jubilee preparations recently to help a Solihull couple celebrate their own 60-year achievement. AN EPIC adventurer has paddled 106 miles around Solihull and Warwickshire canals in just four days for the Children’s Trust charity. TRIBUTES have been laid at the scene of a motorbike crash in Hall Green – in which a father-of-two lost his life. A MOTORCYCLIST has received treatment for multiple fractures after he was hit by two cars in Shirley last week. PLANT a tree for the Queen’s Jubilee - that’s the message from a trio of councillors who have done just that in Malvern Park. Emergency services were called out to the crash at the junction of Haslucks Green Road and Stratford Road shortly after 6.05am on Thursday (March 15).